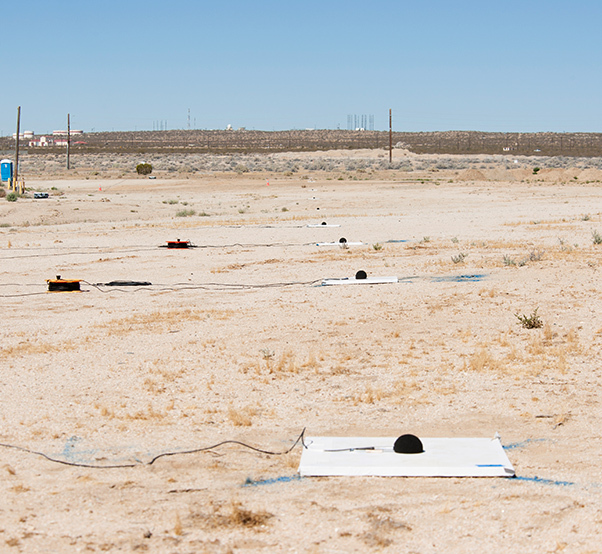 One of three microphone arrays positioned strategically along the ground at Edwards Air Force Base, California, sits ready to collect sound signatures from sonic booms created by a NASA F/A-18 during the SonicBAT flight series. The arrays collected the sound signatures of booms that had traveled through atmospheric turbulence before reaching the ground. NASA has concluded a series of flights designed to study the way sonic booms travel through the atmosphere. 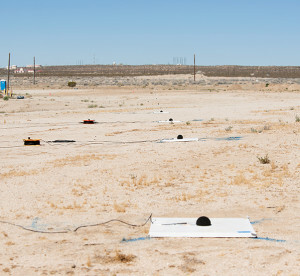 The Sonic Booms in Atmospheric Turbulence, or SonicBAT, flights were performed at NASA’s Armstrong Flight Research Center in Edwards, Calif., in late July, to help NASA researchers measure the effect of low-altitude turbulence on sonic booms reaching the ground. This will help engineers further the study of shockwaves, and will assist in the development of tools necessary to further the development of future supersonic commercial aircraft. The goal of the flights was to collect sonic boom signature data during turbulent atmospheric conditions in a hot and dry climate, in order to develop models for the effects of turbulence on sonic booms, according to the project’s principal investigator, Ed Haering. 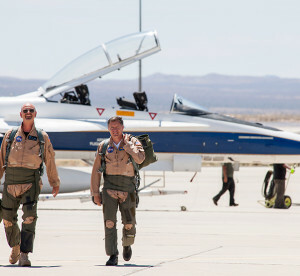 In total, 69 sonic booms were produced over a two week period, in which NASA pilots flew an F/A-18 at a speed of Mach 1.38 to create the shockwaves, which were measured by several elements both on the ground and in the air. 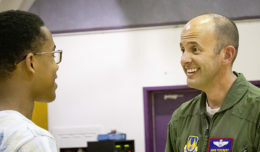 Three microphone arrays, provided by NASA, Wyle Laboratories, The Boeing Company and Gulfstream Aerospace, were arranged strategically on the ground at Edwards Air Force Base to measure and collect the sonic boom signatures. A primary array, consisting of 16 microphones spread over a 1,500 foot span, was used along with a secondary array of eight microphones 100 feet apart, 1.42 miles away. A third array, arranged in the same linear structure as the secondary array, was set up 2.78 miles away from the primary. 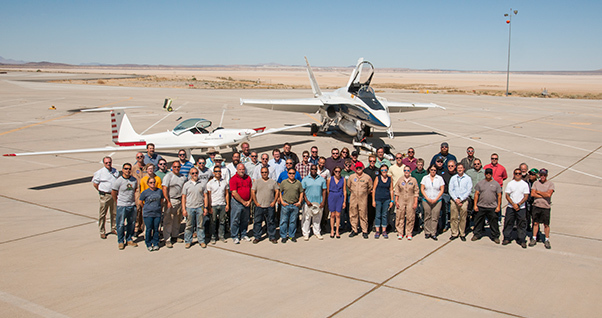 NASA’s SonicBAT team poses in front of the TG-14 motor glider and F/A-18 research aircraft, sitting side-by-side in front of Rogers Dry Lake prior to a SonicBAT flight at Armstrong Flight Research Center on Edwards Air Force Base, California. The TG-14 collected sound signatures of shockwaves created by the F/A-18, to compare with signatures collected on the ground. The principal objective of these ground arrays was to measure the levels of sound waves from the sonic booms produced by the F/A-18, after they had gone through the atmospheric turbulence layer. In order to compare this to data of the same sound waves without the element of atmospheric turbulence, NASA equipped a TG-14 motor glider with instrumentation to collect sonic boom signatures above that turbulent layer. Fitted with a specially-configured audio instrumentation package and a wing-mounted microphone boom, the TG-14 flew patterns anywhere from 2,200 feet to 10,000 feet above the ground. These altitudes were dependent on the time of day of the passes, and the corresponding height of the turbulence layer. The F/A-18, meanwhile, was flying within the supersonic corridor, at 32,000 feet, to produce the sonic booms. The same shockwave recorded by the TG-14 will be compared to that of the ground arrays, giving researchers a better idea of how atmospheric turbulence may influence sonic booms, according to Pauer. 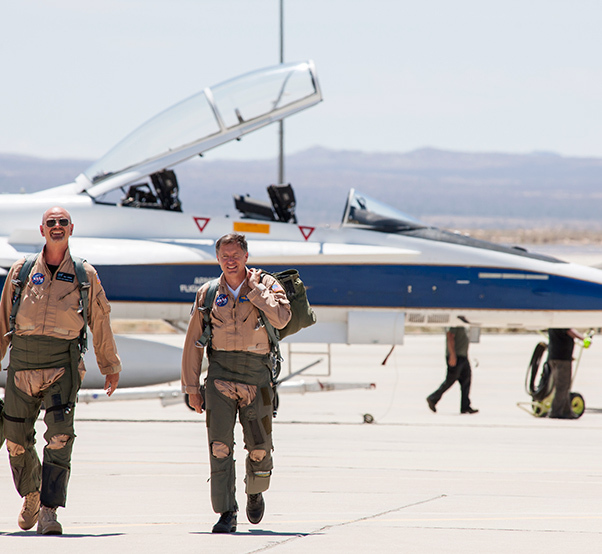 NASA pilot Nils Larson, and flight test engineer Wayne Ringelberg, head for a mission debrief after flying a NASA F/A-18 at Mach 1.38 to create sonic booms as part of the SonicBAT flight series at NASA’s Armstrong Flight Research Center in California, to study sonic boom signatures with and without the element of atmospheric turbulence. In addition to the hot, dry climate of Edwards, the team is proposing to look into the same approach of testing in a damper environment. Potential locations for testing in a more humid region include NASA’s Kennedy Space Center in Florida. 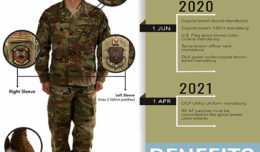 The higher humidity will make the sonic booms louder, and that data gathered will be compared to data collected from the flights over Edwards. SonicBAT is one of the many research efforts of the Commercial Supersonic Technology project, which is an element of NASA’s Aeronautics Research Mission Directorate.